The Rangers were able to shut out the Flyers at the Wells Fargo Center today, with Cam Talbot earning his second win of the season, both on shut outs. Martin St. Louis picked up a goal and an assist, giving him 1,000 points in his NHL Career. 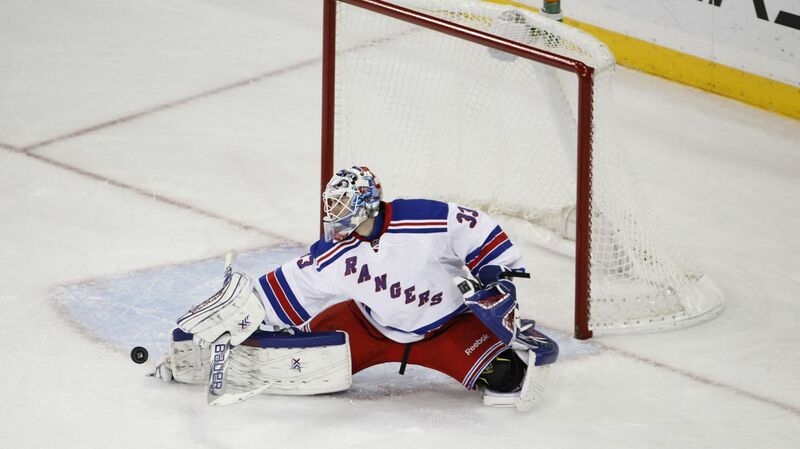 Photo courtesy of The New York Rangers. The Rangers (10-8-4) managed to shut out the Flyers (8-11-3) for the second time this season in the return of Rangers Captain Ryan McDonagh. Cam Talbot, who was in net the last time the Rangers beat the Flyers, managed to shut them out again, bringing his shutout streak over 120:00 minutes. Talbot managed to stop all 26 shots he faced. Martin St. Louis was the biggest story line in today’s game, as his goal and assist brought him to 1,000 points in his career. His second period goal was the one that helped him reach the milestone, and gave the Rangers a two goal lead. The Rangers defense played very well today, with all of them communicating effectively and making smart decisions with the puck. Blocked shots were the name of the game today, with New York blocking 19 of the Flyers chances. Ryan McDonagh led the way with 3 blocked shots. The game started out just as you would expect, with some aggressive play from both teams and a fast paced offense from the Rangers. The Flyers’ Zac Rinaldo took an early penalty for Roughing, and put the Rangers on the Power play. Coming into the game, the Rangers were 4-16 on the power play in the last five games. 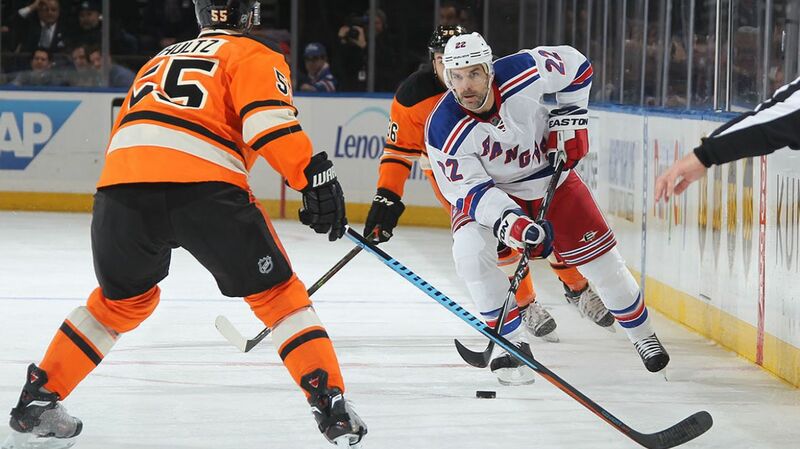 The Rangers would deliver again, and Dan Boyle scored his second goal on the power play in as many games. After chipping the puck in, Martin St. Louis did a good job keeping the puck in the zone, and Stepan fed it to Boyle for the slap shot, which went right through a Rick Nash screen, giving the Rangers a one goal lead just over six minutes into the game. Dan Boyle scored his second goal in the past two games, both coming on the power play. Boyle’s presence on the power play has led to an increase in production, with the Rangers having 22.4% efficiency in the past six games. Photo courtesy of Getty Images. The Flyers would get their own power play, but it was shut down by the Rangers, who continued to get more of their own chances from Dan Boyle and Rick Nash. After being outshot 10-3, the Flyers picked up their play, with the line of Simmonds, Laughton and Raffl providing many of the chances. The Flyers would finish with the last five shots in the period, but Talbot kept the puck out of the net. In the second period, Chris Kreider was sent to the box for high sticking, but some great defense and blocked shots from Marc Staal helped New York kill off the power play. The penalty kill would give the Rangers some momentum, and they were able to capitalize on one of the many Philadelphia turnovers. 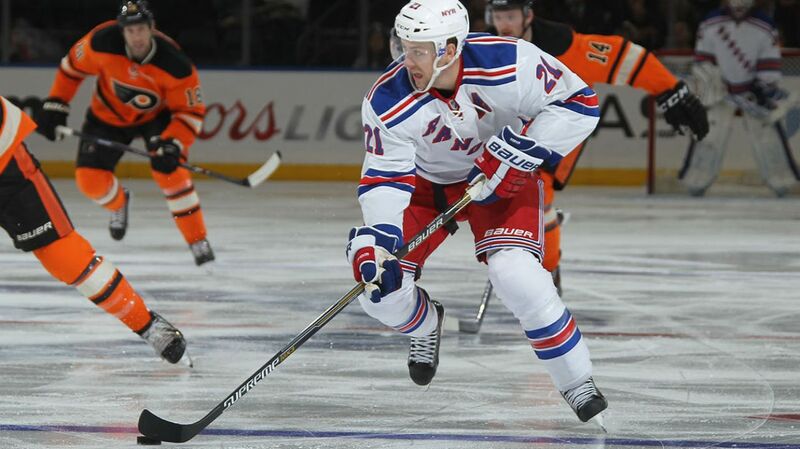 Derek Stepan was able to force a turnover in the Flyers zone, which was kept in by St. Louis. Kreider passed it off to Stepan on the right wing, who shot for a rebound. St. Louis crashed the net and hammered in the rebound, giving him his ninth goal of the season and the 1,000th point of his career. 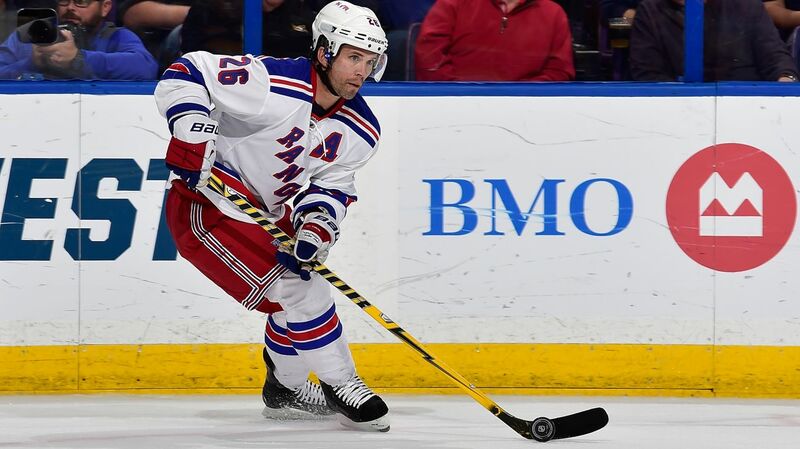 Martin St. Louis picked up an assist and a goal to hit 1,000 points in his NHL career. St. Louis has been red hot lately, and now has 19 points on the year. Photo courtesy of MSG Photos. The Rangers continued to get the majority of the chances in the second period. Mats Zuccarello nearly put in a rebound chance, something that Mason struggled to control. Matt Hunwick also missed on a one timer, but the Flyers were completely outmatched. The Rangers had outshot Philadelphia 9-4 in the first 16 minutes of the period. The Flyers were turning over the puck and had a lot of trouble creating chances, a lasting theme throughout the game. The Flyers would have a four minute power play chance after another Chris Kreider high sticking wound up drawing blood. The power play would prove to be a disaster for them. Dan Boyle won a puck battle along the boards and got it to Nash, who started a 3-on-1 chance for the Rangers. McDonagh made the pass to Stepan on the left wing, and he passed it Rick Nash for a one timer, giving Nash his 16th goal of the season and his second shorthanded goal of the year. 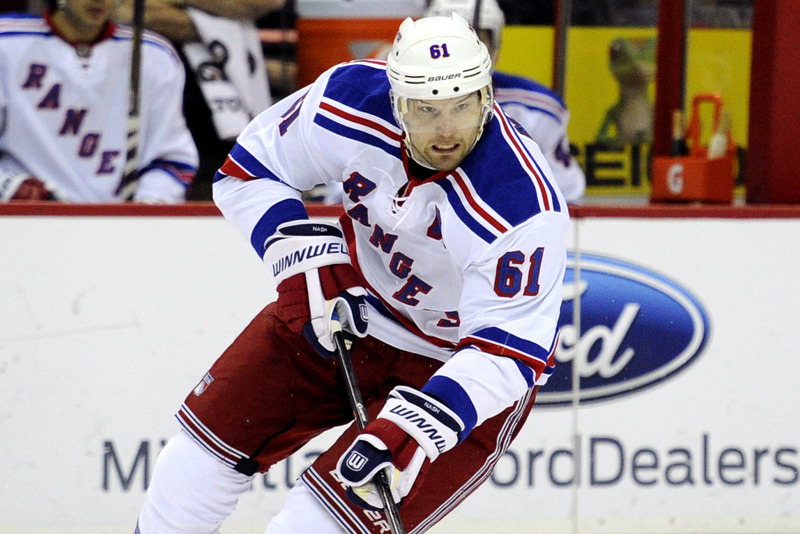 Rick Nash scored a shorthanded goal, giving him 16 this season. Nash continues to be the most consistent player for the Rangers this season. Photo courtesy of MSG Photos. McDonagh picked up an assist in his return and Stepan had his third assist in the game. As the period came to an end, Cam Talbot would stop the rest of Philadelphia’s chances to seal a 3-0 shutout for the Rangers. The Blueshirts managed to earn their third shutout victory in the past four games, stringing together a very well-played game from all over the ice. It was the first time this season that the Rangers had their entire roster healthy. Cam Talbot has shut down the Flyers twice this year, and he earned his second win of the season. Talbot’s performance poses an interesting question. With the Rangers playing the Flyers again tomorrow afternoon, should Talbot start again? Most likely he will not because it is two games in two days, but he certainly seems to have the Flyers’ number this season. Cam Talbot shut out the Flyers for the second time this season, stopping all 26 shots that he faced, getting some help from the solid Rangers defense as well. Photo courtesy of Getty Images. Ryan McDonagh had a big impact in his return. The Rangers have their entire defense healthy for the first time since the first game of the season, and McDonagh led the team in blocked shots (3) and played for 22:12 against the Flyers. The defense communicated well, contributed offensively, and they all played very well. Derek Stepan had the primary assist on all three of the Rangres goals, and continues his tremendous play since his return. Stepan has 11 points (2-9-11) in his first 10 games, and he has been one of the main reasons for the resurgence of the power play and the increase in goal scoring. Derek Stapan had three assists tonight, giving him 11 points in his first 10 games this season. 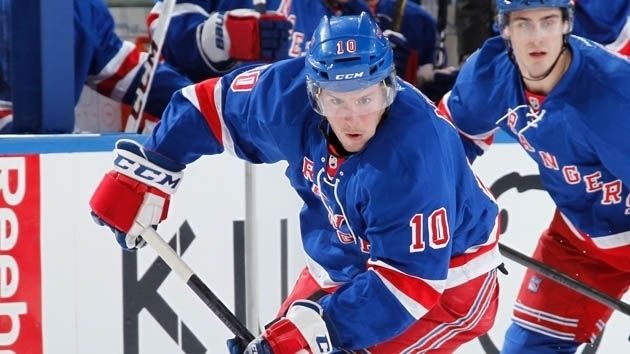 Stepan has solidified the second line center role and has also led to the improvement of the power play. Photo courtesy of MSG Photos. Dan Boyle scored his second goal of the season today, with both of the goals coming on the power play. Since his return, the Rangers power play has improved drastically, going 5-22 (22.7%) in the last six games. Rick Nash scoring is beginning to feel like an every game occurrence. Nash scored his 16th goal of the season, this time on a shorthanded chance. Nash has goals in 14 of the Rangers games this year, and points in 16 of the games. Nash also leads the team with 24 points (16-8-24). The biggest story from this game was Martin St. Louis. His goal and assist gave him 1,000 for his career in 1,081 games. The 5-foot-8 undrafted forward out of the University of Vermont now has another milestone in his hall of fame career. The Rangers will play the Flyers tomorrow afternoon at 1 PM at Madison Square Garden to conclude the home-and-home series. Ray Emery will likely start for the Flyers tomorrow, and Lundqvist will likely get the nod for the Rangers. Don’t expect any lineup changes. Chris Kreider will miss tomorrow’s game due to the passing of his Grandfather. JT Miller has been recalled from the Hartford Wolf Pack to take his spot in the lineup. JT Miller will make his fourth start of the season tomorrow, and will replace Chris Kreider in the lineup. I will be at tomorrow’s game in Section 227 Row 15 Seat 2 wearing my Derick Brassard Heritage jersey, so if you’re nearby, feel free to come and say hello! Follow The Ranger Zone on Twitter @The_RangerZone for news and updates as well as links to all of the articles. Posted on November 28, 2014, in Game Recaps and tagged Alain Vigneault, Anthony Duclair, Carl Hagelin, Chris Kreider, Claude Giroux, Dan Girardi, Derek Stepan, Derick Brassard, Dominic Moore, Henrik Lundqvist, Jakub Voracek, Jesper Fast, John Moore, JT Miller, Kevin Hayes, Kevin Klein, King Henrik, Madison Square Garden, Marc Staal, Martin St. Louis, Mats Zuccarello, Matt Hunwick, Montreal Canadiens, MSG, New York Rangers, NHL, NHL 2014-2015 Season, NY Rangers, NYR, Philadelphia Flyers, Rangers Nation, Rangerstown, Rick Nash, Ryan Callahan, Ryan McDonagh, Steven Stamkos, Tampa Bay Lightning, Tanner Glass, The Duke, The Ranger Zone. Bookmark the permalink. Leave a comment.